Red Funnel Ferries ticket reservations, ferry timetables and passenger information for Red Funnel Ferries sailing to and from City of Southampton to East Cowes and West Cowes on the Isle of Wight. Booking Red Funnel Ferries tickets has never been easier, compare all Red Funnel Ferries prices in real time and book the cheapest available Red Funnel Ferries tickets to and from City of Southampton to East Cowes and West Cowes on the Isle of Wight online with instant confirmation. Travelling by Red Funnel Ferries is a quick, easy and stress free way to get there and back again. Book you Red Funnel Ferries car or passenger ferries tickets with us and enjoy more choice and flexibility. With the latest Red Funnel Ferries crossing information and timetables for all ferries sailing to and from City of Southampton to East Cowes and West Cowes on the Isle of Wight including information on the ferry ports and useful tourist information about the destinations our detailed route and city maps will help you plot your Red Funnel Ferries ferry journey. If are travelling by car, with your family or as a solo foot passenger book a ferry crossing with Red Funnel Ferries and arrive at your destination refreshed, relaxed and happy. Red Funnel Ferries offers fantastic fares to and from City of Southampton to East Cowes and West Cowes on the Isle of Wight ferry ports. Book Red Funnel Ferries tickets to and from City of Southampton to East Cowes and West Cowes on the Isle of Wight online in advance at Ferryto.co.uk and you will always enjoy our cheapest available ferry ticket price. The price you see is the price you pay. There are no hidden extras or surprises such as added fuel surcharges or booking fees and we do not charge you anything extra for paying with a Visa Electron card. The price we quote you for your selected Red Funnel Ferries route, onboard accommodation and vehicle type is all you will pay, and that's a promise. To obtain a Red Funnel Ferries ticket price and book your ferry ticket securely online please use the real time ferries booking form on the left. Southampton is the home port of Red Funnel and their gateway to the Isle of Wight. The city has excellent road, rail and air connections and is easily accessible from all parts of the UK using private or public transport. There is ample parking in close proximity to our terminals for those wishing to travel by foot. Red Funnel is the original Isle of Wight ferry company with a history spanning almost 150 years in its present form but with roots stretching back as far as the 1820's. Much has changed since Red Funnel's paddle steamers ran excursions from Southampton as far as Brighton, Cherbourg and Torquay but we are still just as passionate about delivering great customer service and providing value for money. Today, Red Funnel operate 24/7, 364 days a year and have the youngest and fastest fleet of passenger and vehicle ferries on the Solent. Their Raptor Class vehicle ferries are also the largest with space for well over 200 cars. Red Funnel staff are chosen carefully before being trained to deliver a level of service that strives to exceed customer's expectations. Onboard there is a wide range of good food, coffee, a well stocked bar and relaxing lounges with modern facilities. If you love a sea breeze, there is a spacious outer deck with the best views of the Solent! Aim to arrive at the terminal 30-45 minutes prior to departure, show staff your eTicket and they will direct you to the correct lane ready for boarding. You can purchase coffee, delicious cakes & pastries, newspapers and magazines at the terminal. This route is for foot passengers only as it is onboard high speed catamarans. The crossing time is approximately 23 minutes traveling at 35 knots. Onboard you will find a drinks service. Due to the vessel being smaller than conventional ferries allowing it to travel faster and get you to the Isle of Wight quickly with minimal hassle there are unfortunately no toilets on board and no bicycles are permitted. Wheelchair friendly. 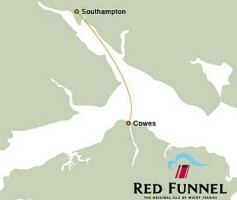 This route offered by Red Funnel is onboard traditional ferries meaning it is suitable for all passengers and all vehicle types including bicycles. The crossing time is around 55 minutes traveling at a speed of 15 knots. There are coffee shops and refreshments available on board as well as a games area. Watch the sea go by on the outside deck. The vessels all have toilet facilities including baby changing. The vessels are all wheelchair friendly with passenger lifts on board. Red Funnel has four Red Jet Hi-Speed catamarans deployed in the UK on its cross-Solent ferry route between Southampton & West Cowes, Isle of Wight. Powered by high-speed diesel engines with waterjet propulsion, the vessels speed, maneuverability, stopping power and low wash characteristics are key design attributes. Red Funnel has three Raptor Class ro-ro ferries deployed in the UK on its cross-Solent route between Southampton & East Cowes, Isle of Wight. Powered by medium-speed diesel engines with Voith Schneider propulsion, the vessels are the largest ever ferries to serve the Isle of Wight. Best Price Guarantee - We always offer you our lowest available Red Funnel Ferries ticket price and there are no hidden extras or surprises such as added fuel surcharges or booking fees and we also we do not charge you anything extra for paying for your ferry ticket with a Visa Electron card. The price we quote for your selected Red Funnel Ferries car or passenger ferry ticket, onboard accommodation and vehicle type is all you will pay for your ferry ticket, and that's a promise! In the unlikely event you find the same all inclusive Red Funnel Ferries ticket cheaper in the brochure of any other tour operator we promise that we will do our best to beat that price or offer you the choice of requesting a refund. To book Red Funnel Ferries tickets please click here. Discounted Group Travel with Red Funnel Ferries - Ferryto.co.uk offer a dedicated personal and affordable Red Funnel Ferries group and coach party ferry passenger reservation service offering you the lowest available ferry rates. Our specialist Red Funnel Ferries group travel team will secure the best deal for you and your passengers. The only requirement to qualify for discounted group travel ferry rates is that your party should be at least ten people and travel at the same time. For more information about group travel on Red Funnel Ferries please click here. Ferry Logistics offer a personal and affordable Red Funnel Ferries freight and cargo ferries reservation service to and from City of Southampton to East Cowes and West Cowes on the Isle of Wight. In addition to offering preferential rates to commercial operators and haulers Ferry Logistics is now also able to offer discounted ferry freight rates to private customers such as those wanting to take transit vans on any of the Red Funnel Ferries routes serviced. For more information and an instant online quote for your commercial vehicle ferry crossing please click here. At ferryto.co.uk you are able to obtain live Red Funnel Ferries ticket prices, check availability, view ferries timetables and book Red Funnel Ferries car and passenger ferry tickets at our lowest available ticket price. Ferryto.co.uk is part of the world's largest online ferry ticket distribution network providing the ability to book over 80 major European ferry operators including with Red Funnel Ferries to over 1,200 ferry routes throughout the UK, France, Spain, Ireland, Holland, Eastern Europe, the Mediterranean, the Baltic and North Africa. Choose Red Funnel Ferries ferries for the cheapest ferry ticket prices to and from City of Southampton to East Cowes and West Cowes on the Isle of Wight.